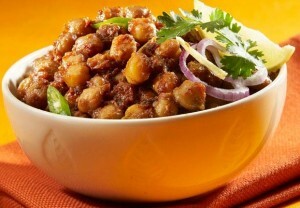 Chana Masala: Chana masala, also known as chole masala is a popular Punjabi dish in Indian and Pakistani cuisine. The main ingredient is chickpeas. It is fairly dry and spicy with a sour citrus note. Chana masala is sold as snack food and street food in Pakistan. This spicy and tempting curry is prepared from white chickpeas, tomatoes, onion and basic Indian spices and enjoyed as evening snack or dinner. Wash the chickpeas thoroughly under running water and then soak them overnight or for 8-9 hours. Boil the chickpeas with some salt and tea bag in a pressure cooker for about 15-20 mins or a covered pan with enough water. Drain the chickpeas (throw away the tea bag) and keep aside. Heat the oil in a pan, on medium heat. Add in the bay leaf, black cardamom, fennel seeds, black pepper corns, cinnamon stick and star anise. After 10 seconds add in the dried red chillies, coriander seeds, mustard seeds fennel seeds and cumin. Add in the onions and sauté it for 2 mins or till the onions become translucent. Add in the ginger juliennes and chopped garlic. After few seconds, add in the tomato puree. Cook till the raw smell of the tomatoes goes away and the oil starts to float on the top. Add the drained chickpeas, 1 cup of water and the green chillies. Stirring continuously, let the curry simmer for 15-20 minutes on a low flame. Add in the garam masala powder and salt, to taste. Cook the chana masala till the desired consistency is achieved. Chana masala is ready to be served. Serve hot chana masala, garnished with chopped coriander leaves with roti, chapatti or naan. If you have any queries regarding the Chana Masala recipe, please leave a comment.